The TOTO S300e Washlet carries over the main features found in the previous-generation TOTO S300 - such as posterior wash, feminine wash, adjustable water temperature, adjustable water pressure, and adjustable spray position. You'll also find the water pulse mode and oscillation feature - which automatically moves the spray nozzle back and forth, widening the cleaning area. Also carried over is the warmed toilet seat feature and tankless (instant) water heating system which has the benefit of continuous warm water that doesn't run out. Some of the new features you'll find include eWater Technology - which uses electrolyzed water to mist the toilet bowl and reduces the need for harsh cleaning chemicals. 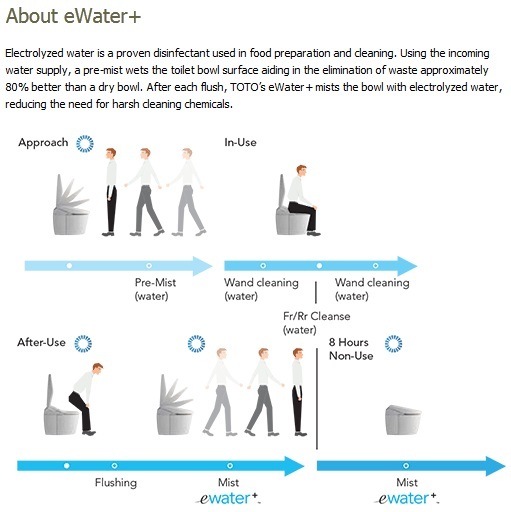 There is also a pre-misting feature which wets the toilet bowl surface before use, aiding in the elimination of waste when flushing (vs. a dry toilet bowl). There is also a newly designed remote control which fits in one hand like a TV remote. The new remote control includes a user-preset function for two people - allowing you and your spouse to have different settings (e.g., different water pressure, water temperature, position of the spray) pre-programmed right into the remote. A new LED night light has been built in the seat as well. So you won't need to blind yourself anymore going to the restroom in the middle of the night. An automatic air deodorizer, slow-closing seat and lid, warm air dry, and power saving mode rounds out the rest of the main features found in this TOTO Washlet. Just installed today! Working great so far, but have not been able to program and use all features yet! To be continued!!! I previously owned 2 other Toto bidet models, which were good. This one far surpasses the others. I ordered the Toto S300e and have been using it for about a month now. The gadgetry of prespraying the bowl, and having an LED to illuminate the toilet water (I suppose to make sure the last user flushed!) are nice. The seat heater works as well as the Brondell, and the washlet sprays warm water without the need for a storage tank to save energy. The only thing that I have found is that the carbon filter doesn't trap as many odors as the Toto Neorest unit, and the sprayer doesn't seem to be as strong, even at its highest setting. It's still a great addition to our toilet, and would probably buy another. the product is great and bidetsplus is great too. this is the best price i get via different sellers. the illustration on the website is so comprehensive and easy to follow. i don't have any issue to install it myself. i used the washlet couple of weeks till now. so far so great. I have not yet installed this product from BidetsPlus, but have a similar one that we have used for years. Outstanding and the seat is heated - nice in the winter. This is a great toilet seat. I tried the washlet when I was in Japan and knew I had to have one. It lights up when I walk into the bathroom, pre-mists the bowl, and the seat is always toasty warm. It has pre-sets on the remote, so it always knows my personal settings. Hooking it up was effortless once I put a GFCI plug behind my toilet. Always wanted one of these. Dived in, paid up, and am so glad I did. Installation was harder than I thought, thanks to a quirk with my toilet, but not too bad. Seat & functions are great. The toilet bowl is now supernaturally clean. I love the clean functions. You need to dab with toilet paper before using the dryer, it will not do the job on its own. I'll end by saying this really has improved my life, and it was worth every dollar. My husband was the one that talked me into buying this bidet. I absolutely love it and would not want to be without it. After living in Japan for 6 years, it never occurred to me that these things are even available in the US. If they were, they would be sold at Home Depot, or Lowe's, right? I was wrong on that one. I learned through a friend that they were available, so I first ordered a C200. My wife thought I was crazy, and thought it looked like something that belongs in a nursing home. Then I returned the C200, and ordered the S300e from Bidets Plus. My wife still thought I was crazy, but like the style and appearance of the S300e much better, so agreed would could have it in our second bathroom, not our main one. Installation was fairly straightforward. The hardest part is getting an electrical outlet in the right place. I used an outlet on the other side of the wall to add a GFCI outlet in the bathroom. Unfortunately, it wasn't directly on the other side, so I had to cut and patch drywall, drill through wall studs to run the wire, and then paint. After all that, it was smooth sailing. The S300e has been great. Works exactly how I remembered them in Japan. Since I have an older home with older toilets, I had to order the round version. The round version doesn't give you as much breathing room as the elongated version, since some space is taken up by the electronics and bidet mechanism. I'm a big guy, but my kibble and bits still fit, although snugly. The instructions aren't so bad if you are used to putting together IKEA furniture. Just look at the pictures and don't try to read them so much. The videos that Bidets Plus have are a huge help if you need them. My only negative is the water supply line being on the left. Toto seems to advertise this as being some kind of benefit. Is sounds like it would be, since the left is also where the water supply for the toilet it, but its way too close. The water supply line that come with the Toto is pretty long, so you end up having this coiled hose next to your toilet that doesn't look very attractive. For that reason, I'm only giving 4 stars. After actually using it, my wife loves the thing. I don't think we can ever own a toilet without one now. She just gave birth, and at the hospital they gave her a sitz bath and a squirt bottle to use for recovery. I told her to leave those at the hospital, and ordered a second S300e for our main bathroom. Of course my wife, being the overly cautious new mom, had to make sure this would be ok to use and actually made the maternity nurse watch the Toto video on her phone. The nurse was blown away by the video, and said yes. The nurse is actually going to order one for herself now! So husbands and would be fathers, if you want to be a hero, order one of these things. Just don't tell her how much it costs. Not inexpensive but fine quality. Easy to install if one follows too-cutsy directions -- could be much clearer. [Hire me, I'll write them so that they are crystal clear for Americans for just $500.] No water leaks the first time I turned the water back on! (And that's rare for a DIY plumber.) Oh yeah, most important, wifey loves it. I would have given this a 5 star rating, but installation was not easy. We also have a Coway bidet seat which we like a lot. Installation was really simple on the Coway but the paper instructions for the Toto are not real clear. I suggest looking up the video on YouTube. We also had issues with the plastic sleeve on the water tube being cross-threaded, but Toto was great and sent another tube. Replacing was easy and the new sleeve went right on! Now that it's installed, we like it! * Excluding installing an electrical plug,VERY easy to install. * Easy to keep clean. * Great features for easy cleanliness. * Remote makes it very easy to use or not use a number of features. * TOTO washlet is a very positive addition to a TOTO toilet. My husband laughed at me when I said that I was ordering this. Neither of us are very handy but he installed it without problem. Now he really likes it. The Toto S300e Washlet is our second bidet seat. Our first, a Toto S300, had to stay at our old condo after it was sold, as it was not going to our my new elongated toilet. I'd purchased the S300 in 2008 and was very happy with its features and build quality. The S300e shares core features with the S300. If anything, I have found the basic cleaning functions to be smoother, and the oscillation and pulsating more effective. However, this may well be a matter of personal preference. The remote control has been completely redesigned, from a large panel to a more compact, TV-style remote. Both sides of the remote are used, with controls on one side and access to various settings, through a small LCD screen, on the back. You can use the remote one handed, and the new mounting hardware holds the remote steady enough that you can still leave it on the wall and select functions. I was initially skeptical of the Toto's new eWater feature, which mists the toilet bowl with electrolyzed water, both before and after use. However, our toilet bowl is noticeably cleaner with the eWater turned on. The S300 was pretty unobtrusive; it didn't do anything until you sat down. Not the S300e. With the unit's default settings, when you move near the toilet it will mist eWater onto the toilet bowl, and a light inside the bowl will illuminate. As well, the S300e will clean its wand every eight hours, and eWater will be sprayed on the bowl, also every eight hours. We have our washlet installed in the master bathroom. I didn't mind the overnight noises, but my partner does, so I turned off the automatic wand cleaning, which was a bit loud. All the automatic functions, including the deodorizer, can be turned off using the control panel. I have also noticed a low hum from the Toto that lasts perhaps 20 minutes after use. We can't hear this in the bedroom, but you can turn it off if you are willing to power cycle the washlet. Is the S300e a better bidet seat than the S300? Its core functions do seem to improve on the S300. But given that there are many other choices in the bidet seat space, a purchasing decision may come down to whether or not you need or want the S300e's many additional features.